Joan Beiriger's Blog: What can you learn from art licensing trade magazines? What can you learn from art licensing trade magazines? An important task in any business is research, research, research. And that is true with the art licensing industry. Art licensing trade magazines are a good source to research the industry. They contain not only articles by industry leaders but they have press releases and advertisements of artists and art licensing agents. All contain valuable information. There are three art licensing magazines; Total Art Licensing (TAL), Art Buyer (AB) and the newly released Art & Design Licensing Source Book (A&D). They are printed in the UK and also have free digital versions. TAL and AB issues are published in January and in May and A&D is published in May. Note: Advanstar, the publisher of License! Global magazine use to publish the Art of Licensing supplement several times a year but it has not been published recently. Researching the industry is not just learning how to license art but finding manufacturers that license art, knowing the key players in art licensing, and also knowing your competition. Below are some suggestions on what to look for when flipping through the pages. Magazines often contain informative articles about all aspects of art licensing. Articles can range from interviewing licensing experts to recent trends. Also observe the name of the person writing the article and the names of the artist, agents, or manufacturers being interviewed to discover key players in art licensing. To gain more information about art licensing, search the internet for those names and examine other magazines, websites and blogs that the names appear. Often there will be an article(s) about future licensing show(s). It may include seminars and who is exhibiting. Use the information to help you decide if you want to attend or exhibit in later shows. 1. It does not cost anything to have a press release (PR) published. However, the challenge is getting the publisher to publish it. Read the PRs in each magazine to learn what kind of information should be included in PRs for that magazine. This will help you write one that will be published. 2. Many PRs announce licensing deals. Read PRs to find manufacturers that license art. Then search the internet for their website and look at the art that is used on their products. Decide if your art fits before contacting them. 3. Also look at what style of art and themes have been recently licensed in PRs. This shows what art the manufacturer thinks will sell their products. Use that information when creating new art. For instance, if greeting card manufacturers are licensing art that has simple girly girl themes (high heels, purses and hats) then "maybe" it would be a good idea to have your version of that theme in your portfolio. But keep in mind that what is shown in PRs was licensed about a year ago and manufacturers may be looking for something new by the time you create the same theme. 4. Studying PRs is one way to determine if your art is licensable. Compare your art with the art shown in PRs. Is your art as polished and skilled as art on the products? Have you created themes that are licensable? Read "Editorial: Not all Art is Licensable" for more information. 1. Advertising in licensing magazines is an excellent way to show art. But it is unlikely that you will get a licensing deal strictly from the Ad. Read "Is it Worthwhile to Place Ads in Magazines" for more information. But if you plan to take out a Ad, examine the different Ads to get ideas on how to layout your Ad. Note: The cost for a half page Ad in the magazines mentioned above is about $300. 2. Look at the art themes pictured in the Ads to see what themes artists are creating. If the same theme is in multiple Ads, then most likely it is one that many artists think are licensable. For instance, Santa and snowmen in Ads are usually prevalent because manufacturers need them each year for their Christmas products. Also look at what themes are missing. It could mean that they are not licensable but it could also mean that you will be the first to create it for licensing. 3. Knowing your competition is important in any business as it is in art licensing. For instance, if you are a fine art painter, then your competition will be other fine art artists. Looking through art licensing magazines will show you who they are. These artists are already established in art licensing and competing against them in getting licensing deals is very difficult. By examining their art, think of ways to differentiate your art from them. For example, create licensable themes that they do not have. As mentioned above, the three art licensing trade magazines are Total Art Licensing, Art Buyer and Art & Design Licensing Source Book. 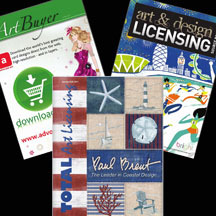 View recently published digital issues "Summer / Fall 2011 Total Art Licensing" and "Summer 2011 Art & Design Licensing Source Book" to see the latest in art licensing. The latest issue of Art Buyer will probably be soon published. I welcome any suggestions and comments. Please write them in the below comment section. Thanks for such an informative post! I had not thought of checking magazines that seem to be more geared to the manufacturers...but there's always something to learn. I think the magazines are more helpful as a promotional tool than a research tool. For example, the summer issue of TAL goes to Surtex, the Licensing Show, and Brand Licensing show, if I am not mistaken. One might have a Surtex booth, but with an Ad, one's artwork goes to all three shows. I think this is an extremely spot-on posting, Joan, and essential reading for artists who want to license their work. As you note, press releases in such publications are free and they're great promotion to companies that are looking for compelling artwork to license for their products. So why not take advantage of it and provide the magazines with content that they need to keep each issue timely, informative and worthwhile reading? I've followed each and every publication in the field of licensing for the last 25 years. They've provided me with many insights into what works and what doesn't work in licensing, what manufacturers are seeking for their products, and what other licensors and licensing agents are promoting as their strongest, market-ready artwork. Ignore these publications and lose access to highly-valuable information about your field. Read them and use them wisely, learn from them, and you'll find that the knowledge and savvy you'll have gained provides a back wind that pushes you farther and faster into a whole new level of success in licensing your art. Thanks for this post Joan. We encourage any artists looking to further their reach to get in touch with us and keep us informed of their work. We do not charge anything for PR and whilst advertising is 'on offer' it remains totally separate. As we also publish titles and organise events in industries such as greetings, gifts, and mainstream licensing - we have great contacts that we are always willing to share. Anyone should feel free to contact us for a chat or to get copies of our publications. I really enjoyed reading this article Joan. I have now subscribed to the magazines and look forward to receiving them. Thanks a million for taking the time to share your knowledge.